When talking about the Czech Republic as a tourist destination, in the mind spring wonderful monuments of Golden Prague and Czech Krumlov. The Czech Republic, however, has many more great historic places that must be visited. Particularly magnetic are the mid- bohemian and Southern Moravian region, where there are the castles Hluboka, Red Lhota and many other beautiful places. Besides the beautiful Prague, Czech Republic’s mid- bohemian side has another hidden gem with great gothic flavor. It's a town called Kutna Hora, which stands only about 60 km from the capital, but annually welcomes nearly as many tourists, as the Golden Prague. Kutná Hora is considered second in importance after the Bohemian Czech capital. There are so many interesting buildings to visit, that it is not surprising it has received the recognition of UNESCO, which includes some of them in its list of World Heritage. Kutná Hora is a true open-air museum. The city was founded in the 13th century near the silver mines. Thanks to them, the village prospered enormously fast - deposits proved so rich that at the end of the century about one third of Europe's silver is mined here. It is from this that fact comes the main currency - silver groshes. From 13th to 16th century, Kutná Hora competed with Prague economically, culturally and politically. Recognition by UNESCO for its unique historical heritage of the city came in 1995. The focus of the organization falls downtown. The central square of Kutná Hora is the starting position for the exciting sights of the city. From it start several branches that lead visitors to the most beautiful places. The first attraction is the magnificent Gothic cathedral Saint Barbara, considered one of the most important and valuable for the whole Czech Republic. The Cathedral is located slightly below the street level and at first one sees only her roof called "the Festival of Saint Barbara" Cathedral Kutná Hora begins with a picturesque and well arranged park. Legend has it that Barbara was introduced to Christianity by her nurse. Her father was Muslim and in the twinkling of an outrageous fury, builder of the murder of his own daughter as a play to give her a lesson. The father of Barbara would appear exactly in the moment before she is beheaded her sin and to simplify it as a sign of great nobility. Unfortunately, the gathered crowd prevented the father to get to the place of the death penalty, and Barbara was murdered. Since then Barbara is worshiped as a saint. Inside the cathedral Kutná Hora is a great fresco which reproduces exactly this time of the murder of Barbara. The temple is famous for its stained glass. In translation, Kutná Hora means dug Mountain, which probably comes from mines. Today they are one of the landmarks of the city, visited with a guide and are not recommended for people suffering from claustrophobia. Opposite St Barbara is the former Jesuit College - St. James church from the 17th century. Exquisite antique pieces can be seen in the female monastery Ursulinok. 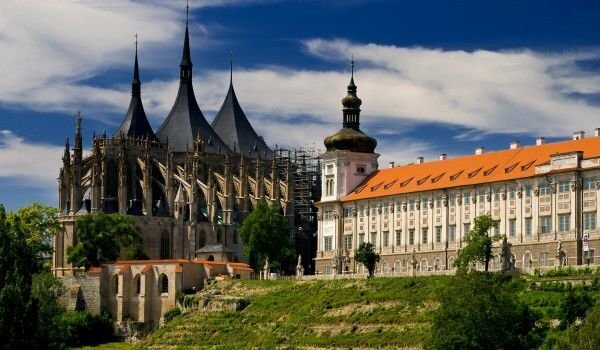 In this temple of Kutná Hora is built the beautiful "Festival of the Virgin Mary." This is a five part body with a wreath of seven towers, founded in 1300 and considered the largest and most complex equipment which is preserved on Czech territory to the present day. Highlight among the monuments of Kutná Hora, however, is the famous church ossuary found in Sedlec made from the bones of 40 000 dead. Sedlec is a town next to Kutná Hora. The interior of the temple is made of human skulls and bones - a view that can not be seen elsewhere. According to legend, in 1278 King Otakar II sent the Bohemian abbot Sedlec to the Holy Land with a diplomatic mission. Sedlec had taken from these lands a finger and then sprinkled it in the cemetery of the monastery and it began to be celebrated as a Holy Land. Each of the rich and noble Czechs, Poles, Belgians and Bavarians believe that it is a matter of honor to be buried here. In the cemetery was built the Gothic church "Halloween" in 1400 after various parts of the cemetery were gradually removed, with bones piling up in huge pyramids inside the temple. Frantisek Rint was able to realize his idea to decorate the church with the bones between 1703-1710, all skeletons, skulls and bones were treated, disinfected and bleached with chlorine mixture, and strung in various forms. Of human remains were made giant chandeliers, candlesticks, cups, the Schwarzenberg family coat of arms, arabesques on the walls, etc. Most impressive is the huge chandelier made of all available bones in the human body.